Aha! What's on our cooking page today foodies? I decided, yes I, decided it should be a vegetarian curry. 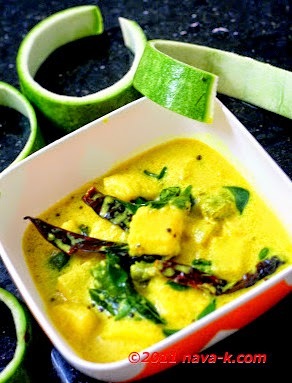 Not those fiery red curries though (Indian Vegetable Curry, Indian Tofu Curry & Cauliflower Curry), but a yellow hue eye popping curry (Sodhi/Coconut Milk Stew, Bitter Gourd Sambar & Sambar/Dhal Curry). Mor Kuzhambu, aka yogurt curry, aka buttermilk curry. Interesting right? I know. Mor Kuzhambu. A tiny boost of spiciness, coconut and cumin paste enhanced and walla, speak about the scent of curry leaves. Add gourd, green chillies, turmeric powder, water and salt into a pan. Combine in the coconut cumin paste and simmer over low heat. In a separate pan, heat oil and when heated, fry mustard seeds, dried chillies and curry leaves. Tip into curry and off the heat. Add yoghurt and stir in. That dish looks so good and is a nice way to prepare squash a little bit differently than what we're used to. I don't know about this dish. But I do make a similar one with spinach fritters. But its nice to see a different kind preparation for ash gourd. Thanks to your link to the ash gourd I now have an idea of what the veggie is actually like. It does appear to go well in sweet as well as savory dishes-which is a good thing which leaves me wondering why it is not found here. The spice and sour seasoning does make for an interesting blend of flavors and the broth looks rich and creamy, definitely something I would enjoy! Tasty post! This looks great! I am trying to make an authentic Indian dinner tonight - looking forward to it! Another mouthwatering curry recipe from you, Nava! What a delicious way to use ash gourd! Love this recipe.I just love the South Indian curries any day and this seems to be a pretty easy recipe as well.Thanks for sharing Nava! The colors of this dish are gorgeous...love the vibrant green and yellow! And I can imagine it tastes as good as it looks! I'm not sure I know what an ash gourd is, but I love the looks of this curry! hi nava, never tried this before, mmm look so delicious- i must learn to use yogurt in gravy, its so nutritious. have a nice day. your pic looks great dear! Delicious, would love to eat that with some hot rice! Oooh, curry with yogurt?! YUM! Sounds like an amazing dish! Thanks for all the sharing everyone. Btw, for those who can't or don't know what is ash gourd, its actually winter melon and you can also replace this veg with long beans, french beans and even pumpkin will blend perfectly well inside. I'm back from trip & resuming my blog hopping. I've only tried yoghurt as desserts, honestly. Your description makes me wanna dig into your bowl of yoghurt curry. This dish looks awesome. Lovely colors. Super tempting it is. Love it.